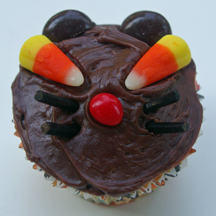 These cat cupcakes are ready for Halloween with their angled candy corn eyes! What You Need: 1 cupcake; chocolate frosting; black string licorice; 2 pieces candy corn; 2 Junior Mints; 1 red hot (cinnamon imperial). How to Make It: Frost cupcake. Cut off 1/3 of each Junior Mint and stick near top of cupcake for kitty ears. Add red hot nose and candy corn eyes. Cut four lengths of string licorice for whiskers. This entry was posted on Tuesday, September 29th, 2009 at 12:26 pm	and is filed under animal cupcakes, Halloween cupcakes. You can follow any responses to this entry through the RSS 2.0 feed. Responses are currently closed, but you can trackback from your own site.